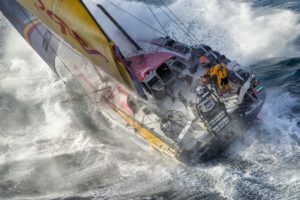 During the nine months of the 2011–12 Volvo Ocean Race, which started in Alicante, Spain in October 2011 and concluded in Galway, Ireland, in July 2012, the teams were scheduled to sail over 39,000 nmi (72,000 km) of the world’s most treacherous seas via Cape Town, Abu Dhabi, Sanya, Auckland, around Cape Horn to Itajaí, Miami, Lisbon, and Lorient. As in the previous editions the 2014–15 Volvo Ocean Race started in Alicante, Spain on October 11. Destination was Gothenburg, Sweden, scheduled for June 2015, with stopovers in the ports of Cape Town, Abu Dhabi, Sanya, Auckland, Itajaí, Newport, Lisbon, Lorient, and with a Pitstop at The Hague through the last leg. Each of the entries has a sailing team of 9 professional crew (in the 2014-2015 race) who race day and night for more than 20 days at a time on some of the legs. The crew members are required to be more than sailors, some of them will be trained in medical response, sail-making, diesel engine repair, electronics, nutrition, mathematics, and hydraulics. There is also a dedicated media crew member who does not contribute to the sailing of the boat. In the 2017-2018 race the number of crew can between 7 and 11 depending on the gender ratio. No fresh food is taken on board, so the crew lives off freeze-dried fare; they will experience temperature variations from −5 to +40 degrees Celsius and will only take one change of clothes.